French Holly had no ivy, but he did score a win in the most appropriately named race, the Christmas Hurdle, and managed to provide the undisputed champion hurdler Istabraq with some competition. An American bred son of Derby winner Sir Ivor, French Holly was strapping dark bay gelding from one of that stallions last crops. The value of his sale as a two year old was closer in worth to a lump of charcoal than gold, but his price of $2,000 belied his talent and later earnings. 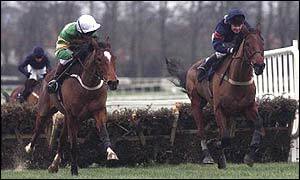 Trained by Ferdy Murphy, French Holly made his racecourse debut in 1996 as a five year old in a Uttoxeter Bumper. Sent off favourite, he duly won by an easy four lengths. He contested three more Bumper races and finished eleventh in the Queen Alexandra Stakes at Royal Ascot, before switching to hurdles. Although clearly a chaser by physique, French Folly belied his frame to rise to the top of the ranks over hurdles. In his debut over flights at Haydock in December 1997, he beat future Grade 2 winner Foundry Lane by a comfortable three and a half lengths. Better was to come, when he stepped up to win the Grade 1 Tolworth Hurdle at Sandown, and a minor race at Huntingdon in preparation for the Cheltenham Festival. This last race showed that he stayed the distance of two and a half miles really well, and he was duly aimed at the Royal & Sunalliance Novices Hurdle. Sent off favourite, French Holly could not have been more impressive in winning by a dominating fourteen lengths. Although the recent trend had been for winners of this race to step up in trip, the previous year’s winner (the one and only Istabraq) had already demonstrated that this race was a viable route to the Champion Hurdle. The decision was made to keep French Holly over hurdles, at least for the following year, and he was expected to make a mark in contests away from Istabraq. However, his year got off to a bad start when he lost his action in the mud at Ascot and was pulled up. A second place finish to Date Star in the Fighting Fifth Hurdle was an improved effort, before he lined up in the Christmas Hurdle. Despite Dato Star being rated an evens favourite, he was no match to a revived French Holly, who bounded away from the field to win by nine lengths. In the process, he marked himself out as one the finest hurdlers in the British Isles, and a possible quality opponent to Istabraq. Connections tested that theory early in the Irish Champion Hurdle, but despite French Holly giving his all, Istabraq was not extended in winning by a length. Regardless of that defeat, French Holly lined up in the Champion Hurdle at Cheltenham but, like the rest of the field, was swept aside by Istabraq on his way to his second consecutive win. He had one last crack at the Champion in the Aintree Hurdle, yet the result was the same as in the Irish Champion Hurdle: Istabraq winning hard held on the bridle. French Holly also raced in France, where he won the prestigious Prix la Barka, before being sent over fences, where many felt his true talents lay. He certainly didn’t let his backers down, and in his first novice chase thrashed a small field by eighteen lengths. Many targets were suggested for the horse, including a speculative tilt at the Cheltenham Gold Cup, but tragedy struck before any plans could be laid. In a schooling exercise, which even his connections admitted was not strictly necessary, French Holly slipped and was tragically killed. It was a sad loss for racing. Perhaps not the cheeriest of Christmas tales, but French Holly is a reminder that we must value life in all its fleeting joy.